We're so excited about this blog post today you guys! It's a special and unique one. We were lucky enough to have an amazing couple choose us and Lola Del Campo, with Florenta, to create their beautiful Persian Wedding here in Cabo. At a beautiful hotel nonetheless, called Viceroy. Have you ever heard of a sofreh aghd? Most likely not, but it is beautiful. A sofreh aghd is part of a traditional Persian wedding ceremony and typically, Iranians practice this cultural wedding ceremony despite differences of faith. Translated, "sofreh" means "spread" and "aghd" means "ceremony" and there are many traditional ways to set this up, but of course it's also designed to fit the couples style as well. In the photos you'll see the sofreh aghd is really intricate. The table is full of different items that all have special meanings. Starting with the mirror and the candles, that are always part of these spreads, the mirror is there for the couple look into together because it symbolizes bringing light and brightness into the future of the newlyweds. While the candles represent energy and clarity in the couples lives. Then, there are usually eggs, fruits, and nuts. The eggs represent fertility and the fruits, that are typically pomegranates and apples represent a joyous future. Then the nuts, that are either almonds, hazelnuts, walnuts or all three, also symbolize fertility and abundance. Another part of the spread is a decorative display of Noon-e Sangak (Persian Flatbread) that represents prosperity in the feasts and life the couple will have together. Sometimes used are items such as honey, rock candy, sugar cones, sweets & pastries which all represent sweetness in the couples life together. A mix of herbs and spices is also present in the sofreh aghd as well as their holy book of choice. Depending on their religious beliefs they choose their holy book and it's usually opened in the middle and placed in front of the couples seat. Finally, the seat. The couple sits either facing their friends and family with the sofreh aghd in front or they sit with their backs to their friends and family. Their seat is typically two stools or some type of cushioned seating, in this case they had a sofa. As you can see this wedding is all about the details! And we LOVE it. For the reception, this couple had what we know as a tradtional reception with dinner and dancing, but in typical Persian weddings the reception is more like what we know as a bridal shower with finger foods, sweets and gifts. Our couple wanted their wedding to be very modern and clean with impeccable design while focusing on perfection, so we tied in a lot of white and translucent pieces that feel like modern luxury as well as some sparkly aspects on their sofreh aghd for elegance. 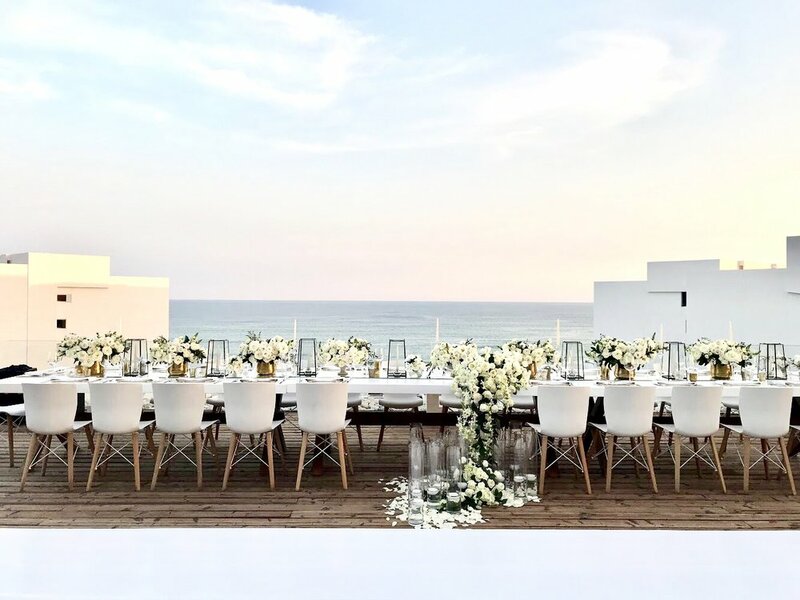 Having the wedding at Viceroy also made this wedding possible since the hotel is ideal for a clean, modern look. This wedding wasn't the "normal" or "typical" type of wedding we do and were so glad because it showed us a new culture and a new, yet very beautiful and joyous ceremony. Setting up and designing this decor with Florenta was a creative blast! We can't wait to do another Persian wedding!